I called myself "Crazy Pants" while wearing this outfit. And also, "Crazy Tall Lady." The second one wasn't new, but when I put on these heels, I just had to acknowledge how awkward I felt being 8 inches taller than everyone else. But, "Crazy Pants," yes, that one was new. Let's just say there was no hiding in the background for me when I wore this outfit. People kept shouting "love the pants" and I kept responding "yeah... just call me Crazy Pants!" These pants are not for the faint of heart, ya'll. But luckily, I love 'em. 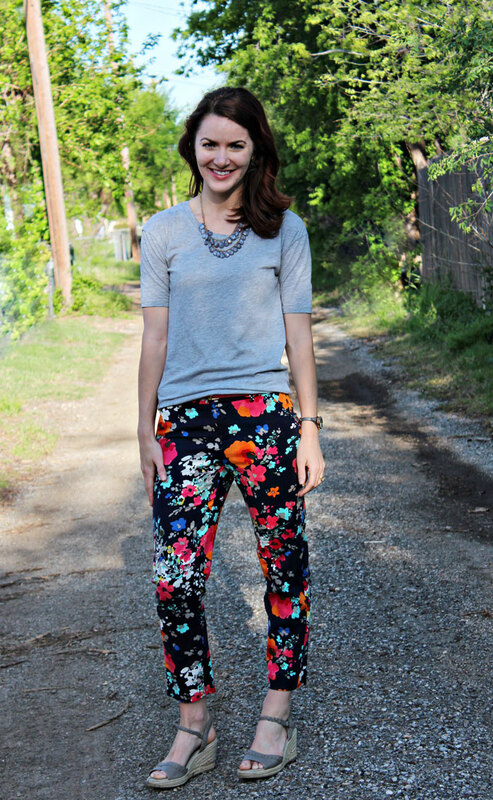 I definitely made the right call during the floral pants hunt. I am pretty much obsessed with all the floral going on this season. Just call me Crazy Floral Lady. Okay... too much, Ashley... too much. Not crazy pants at all! Love the floral print! I love those crazy pants! I actually have floral pants of my own, and my husband says they look like an old lady's couch. But I wear 'em anyway cuz I love them all the same. They're super cute on you! Miss Crazy Pants Lady, I LOVE THESE ON YOU!!!!!! The color, the print, the cut. I really like this and these pants are very flattering on you! Nothing wrong with being a crazy pants who is taller than everyone else. My co-workers always say something when I wear high heels, because I tower over them! Exactly! I'm tall anyway, but when I put on the heels, it's just out of control! I have been eyeing those at Target! I love these pants! I love how you dressed them down with a gray tee. You look great! 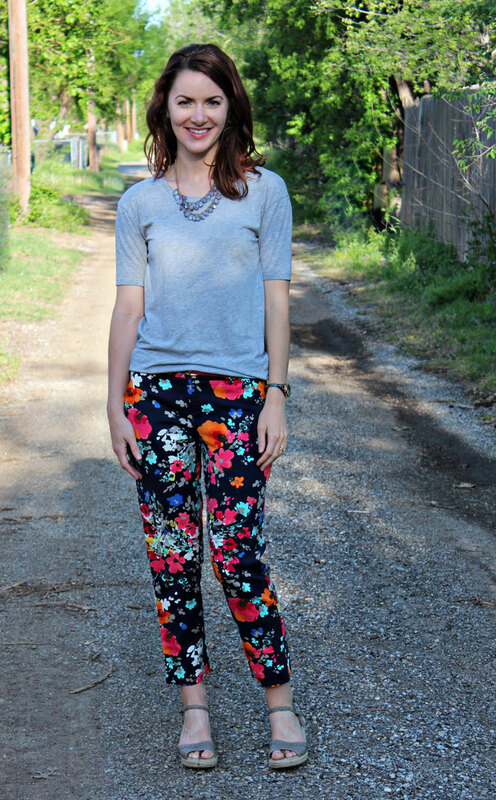 OMG have those pants too & LOVE HOW YOU PAIRED THEM WITH A SIMPLE GRAY TEE! Oh awesome! I will definitely be looking to see how you styled them on your blog! not crazy pants at all! cute pants for sure! Your pants are adorable. I love the crazy print. My kind of style. I love these pants, Ashley! Perfect look! I like your "crazy" pants (even though I don't think they are that crazy! How tall are you? I'm 5'9'' and I always feel so much taller than everyone else! I didn't know you were that tall, Fran! It's nice knowing I've got another tall blogger friend :) I'm 5'10", so I try to stay away from heels as much as possible. My husband is 6'2", which is nice whenever I do want to wear heels - at least I'm not taller than him haha! Haha Ashley you had me laughing with this post! From one tall girl to another, I personally love that if I gain an extra few pounds nobody really notices :) Embrace it girl! Now I just have to ask, if you're 5'10" and those wedges are maybe 2 inches, why is everyone around you only 5'4"?? Did you get the "you're as tall as a weed, but as pretty as a flower" pick up line? Haha. I got that "compliment" from distant relatives every time I saw them every couple of years. Hahaha, I have never gotten that pick up line, but I feel like I'm missing out! I'm laughing at the title because I have a nutty neighbor that I have named "crazy pants" :) I have that same floral print in a Target skirt, love it! I have been wanting to try out the floral pants trend for awhile but haven't found the right pair...These are gorgeous!! If it weren't for my shopping ban right now, I'd be on my way to Tarjay to pick these lovelies up! These pants are so pretty! I love the bright colors against the dark background. Cute outfit. I love the adorable print pants! Heels! You're so fashion forward. But hey, it looks good. I have a new theory that you can wear anything the heck you want (including ill-fitting Russian Bag Lady apparel), and as long as you wear it with heels, people will think you're cutting edge. Meanwhile, if you're us, you'll feel like a stork. Glad to see those pants in action. Haha, I felt crazy in them as I'm sure you can imagine :) And I think your theory is right - heels just seem to make everything seem more fashionable. I like your "crazy pants"! Your tall figure wears them beautifully. Pretty neck lace and shoes. These pants are fantastic! Crazy to the real world, maybe, but I'd say they're pretty darn fabulous to the fashion blogging community. I love the wedges too! Such a pretty outfit. 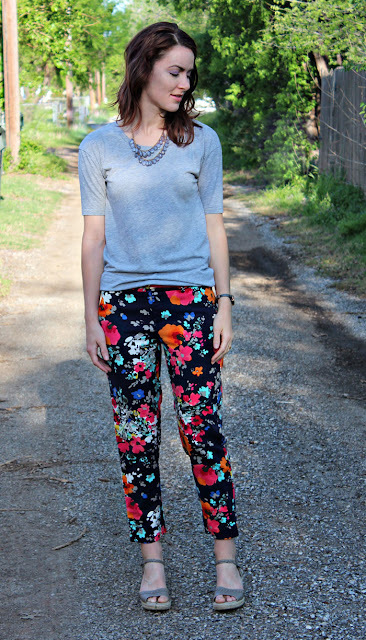 I adore those floral pants....I have a similar H&M pair that goes with almost everything in my closet. Keep on blogging! You look so pretty! I'd not have the guts to wear them but they really aren't so crazy on you. They're quite cute!